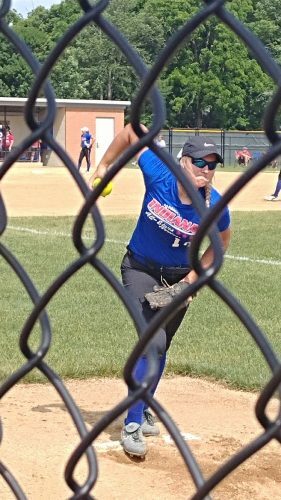 CARMEL – Meghan Fretz ended her sensational softball career on the high school level with a bang Saturday. The Wawasee High School star homered in game one to help her North All-Star team top the South 9-8 in the ICGSA North-South All-Star Classic. The South took game two of the twin bill 5-1 in the pair of contests played at the Cherry Tree Softball Complex. Fretz’s blast in the opener put her team up 5-4. She also pitched in the first game, following Danielle Watson of Penn in the circle. Fretz helped lead Wawasee to its first-ever regional championship during the 2017 campaign. She went 15-3 in the circle and batted .416 at the dish as the Warriors posted a 25-4 mark, ending the season with a 3-0 loss to South Bend St. Joseph in a semifinal game of the Class 3-A Twin Lakes Semistate. Fretz, who will continue her career at Huntington University, helped Wawasee go 14-0 in the Northern Lakes Conference for the first time in program history. The Warriors won the NLC title for the third straight season in 2017. Wawasee coach Mike Barger also took part on Saturday as a coach for the North squad. Barger, a 2001 WCHS graduate, guided the senior-laden Warriors to the most successful season in history in his first season as coach. He spent the previous two years as the softball coach at West Noble High School. Whitko High School standout Kennedy Krull, who was a second team All-State pick in Class 1A/2A by the ICGSA, also saw action for the North All-Star team. Krull, who will also play at Huntington University, played shortstop, second base and left field. Krull, who played shortstop for the Wildcats, helped lead Whitko to a historic season in her senior year. Whitko went 24-6 and won the program’s first sectional championship since 2005. The Wildcats then won the program’s first-ever regional title and its first semistate game before losing to No. 1 Elwood in the LaVille Semistate championship contest. The North All-Star team also included Watson and Katie Quinlan of Penn, Brooklyn Howard of Manchester, Shannon Arndt of Bremen and Liz Bollinger of Mishawaka Marian. Penn’s Beth Zachary was honored as the ICGSA Softball Coach of the Year. Zachary guided Penn to a 27-2 record this Spring. The Kingsmen, who were ranked No. 1 in Indiana and No. 14 in the country by USA Today, lost to Crown Point in the Class 4-A semistate semifinals. Crown Point went on to win the Class 4-A state championship. Zachary, who led Castle High School to a state title in 2001 as a pitcher and then played at IPFW, is 235-58 in her 10 seasons at Penn. She was also the Coach of the Year back in 2010. Ashton Slone of Plainfield was honored as Miss Softball. Slone, who had one of the nation’s top batting averages this season and set a state record by hitting safely in 44 straight games over the past two years, will play at Miami of Ohio. Slone, a first baseman/catcher, led the state in home runs as a junior with 13 as her team set a single-season state record for roundtrips, surpassing the previous mark of 33 set by Warsaw.